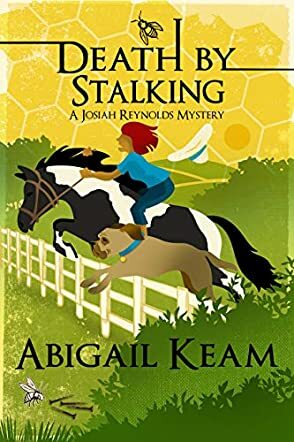 Death By Stalking: A Josiah Reynolds Mystery is a sleuth mystery novel written by Abigail Keam. Someone had killed Gage Cagle during the Bluegrass Antiques Auction, and Josiah’s friend, Rosie, was being held as the most likely killer. Josiah had actually found Rosie holding a likely weapon, with her brilliant yellow dress stained with Gage’s blood. Rosie and Gage had been at odds for what seemed like forever. Gage was a cranky and embittered old man who had resented his mother’s affection for Rosie when they were both children, and he never did accept the fact that his parents had sold a piece of their land to her and had granted her a right of way easement over his property. Earlier that evening, Gage had threatened to kill Josiah’s dog, Baby, and had hinted that he might actually shoot Josiah and Rosie as well. There were others, however, who were also not at all happy with the cantankerous old man. An antiques dealer at the auction was seen angrily remonstrating with him after a disastrous bid, and then there was that mysterious, elfin man no one recognized. Josiah had been depressed lately, but saving Rosie and getting to the bottom of this mystery was definitely getting her out of her slump. Abigail Keam’s sleuth mystery novel, Death By Stalking, brings the English cozy mystery home to Kentucky’s Bluegrass in a most delightful way. Keam gives the new reader enough background information within the story for it to be enjoyed as a standalone, but you won’t want to miss a single book in the Josiah Reynolds Mystery series. Keam’s characters are well defined and credible, and her plot fairly bristles with red herrings for the armchair sleuth to consider while reading. I especially enjoyed the visit of Josiah’s daughter, Asa, whose expertise as an antiques appraiser is a joy to watch. Asa’s brilliant antiques knowledge reminds me of Jonathan Gash’s marvelous Lovejoy; I’m hoping to see a lot more of her in future books. Death By Stalking: A Josiah Reynolds Mystery is most highly recommended.